Keeping your business expenses in check takes a little more than perseverance and luck. It can take a good small business accountant and some excellent advice. The following is a list of four mistakes that a new small business owner may make every day. Some of these mistakes can mean the difference between a business becoming a success—or one that just doesn’t make it. When your business was just starting out, you probably maintained your own books, filed your own tax returns, made your own invoices, answered your own phones and got your own coffee. While this strategy works in the first year of a business, it’s not maintainable much longer than 12 months. From handling your own bookkeeping services to filing your own tax returns, it’s easy to make mistakes and extremely time-consuming to keep up a business’s books—especially when the whole reason you got into your business was to make a great product or service you were passionate about. 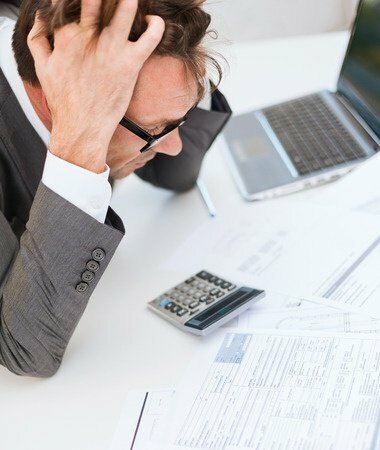 Though it might be extremely tempting to file your own tax returns come tax season, it’s one of the surefire ways to sink your business. Most small business owners don’t understand complex and sophisticated tax questions that a CPA would be able to decode in a jiffy. Most small business owners also aren’t familiar with all the tax deductions that are eligible to them. Do yourself a favor, and hire an accountant after your first year of business. You’ll spend less time elbow-deep in tax documents and more time interacting with customers, vendors and even your baby itself—the product or service you created. Many small business owners do not separate business and personal expenses in the first year of business. This is often because many of these expenses bleed together. You find yourself dishing cash out of your own wallet to buy coffee for your employees, a round of drinks for some investors or even supplies for the office. Like doing your own accounting and taxes, these habits are relatively normal for the first year of business; after the first year, you should separate your business accounts from your personal accounts. You may still find yourself dipping into your wallet or checking account for cash, but these instances should be monitored and tracked on expense reports. When you look only at the balances, expenses and profits of the business you’re running—and not your personal accounts—you can accurately forecast budgets for the upcoming months, quarters and year. If your personal accounts continue to clog this information, you might inaccurately believe you have more (or less) cash flow. Your taxes can also be affected by inconsistent business books and combined accounts. You may be eligible for tax credits you never knew existed, or you might be responsible for fees to the IRS that you were previously unaware of—and you don’t discover until it’s too late, and you’re buried in fees. Keeping your books separate can save you time and money when it comes to tax season. Back when your business was just a baby, you probably had a jumble of receipts, rolled up in a plastic bag that you never looked at. You probably assumed that you were keeping huge stacks of paper hanging around your home or office and decided to take them to the shredder. This is the absolute worst thing you can do as a small business owner. Unlike for your personal expenses, your business expenses need to be accounted at all times. Should the IRS audit your business, you’ll need proof of all your business expenses, including travel, food, supplies and healthcare payments. Keep your receipts organized by day, month, quarter and year, so you never need to worry about finding them for tax season or an IRS audit. Saving receipts is also an easy way to keep your expenses organized. You can enter them into a bookkeeping software system, send them to your small business accountant or pass them off to an employee to manage your finances. You’ll never forget about an expense or purchase again. This can also help with projecting your expenses for the future quarters and fiscal years. You can even use your receipts to categorize expenses into categories like office expenses, client expenses, travel, bookkeeping or conferences. In the future, if you’re looking to cut back your expenses, you can always turn to your receipts to discover areas of overspending. No one cares about when you reconcile your accounts—except you. Though you can probably think of at least 20 different ways you could be spending your time rather than reconciling your books, it’s important to keep your books in check at least quarterly and annually. If you can reconcile annually, you’ll be better off because this ensures that your bank account balances and credit card balances agree with the charges and purchases you’ve made. If you reconcile your bank statement months after you’ve made a large purchase—only to discover you were charged significantly more for an item, you probably can’t do much about it. Yet if you catch the erroneous charge within the same month, you can contact your credit card company to ensure you receive a refund. If you have a team of employees (or even just one employee) that uses your credit card, you need to ensure they are making good choices regarding their purchases. Even if your employees are using their cards only for approved expenses, they might be able to save some money by purchasing a generic brand or shopping for office supplies at a bulk store instead of the high-end office supply store. Running your small business takes a lot of time. Don’t waste your time doing your own books and filing your own taxes. The amount of money you’ll save in the long run by hiring a company like Larry L. Bertsch CPA & Associates, LLP will keep you sane and your business running smooth.